Asian longhorned beetle with round exit hole. WASHINGTON — The U.S. Department of Agriculture’s Animal and Plant Health Inspection Service (APHIS) wants to remind the public that August is Tree Check Month. This is the best time to spot the round, drill-like holes made by the Asian longhorned beetle (ALB), a highly destructive invasive pest that destroys trees. 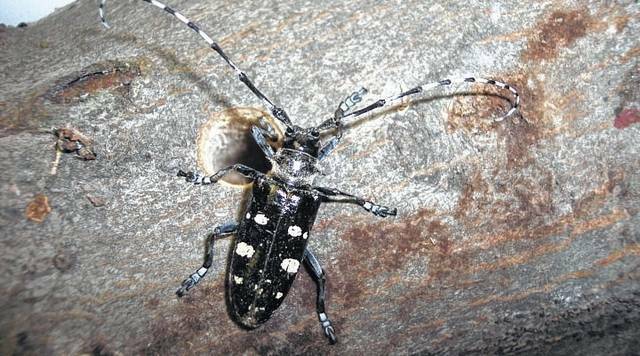 The Asian longhorned beetle has the potential to destroy millions of acres of America’s treasured hardwoods, including maple, birch, elm, willow, ash and poplar trees. Unfortunately, there is currently no cure to save infested trees. They need to be removed to keep the beetle from spreading to nearby trees, as well as to protect homes and other personal property, since infested trees will die and can drop branches. The beetle is slow to spread on its own during the early stages of an infestation, so early detection and reporting is critical to containing it. People can also help by not moving firewood from areas quarantined because of the ALB, which can transport the beetle hidden inside to new locations. • Long antennae with black and white bands, longer than the insect’s body. • A shiny, jet-black body, about 1” to 1 ½” long, with white spots. • Six legs with possible bluish-colored feet. • Round exit holes, about the size of a dime or smaller, in tree trunks and branches. • Shallow oval or round scars in the bark, where the adult beetle has chewed an egg site. • Sawdust-like material, called frass, on the ground around the tree or in the branches. • Dead branches or limbs falling from an otherwise healthy-looking tree. • Make note of what was found and where. Take a photo, if possible. • Try to capture the insect by placing it in a container and freezing it. Doing so will preserve it for easier identification. • Report findings by calling 1-866-702-9938 or completing an online form at www.AsianLonghornedBeetle.com. https://www.recordherald.com/wp-content/uploads/sites/27/2017/08/web1_Beetle.jpgAsian longhorned beetle with round exit hole.